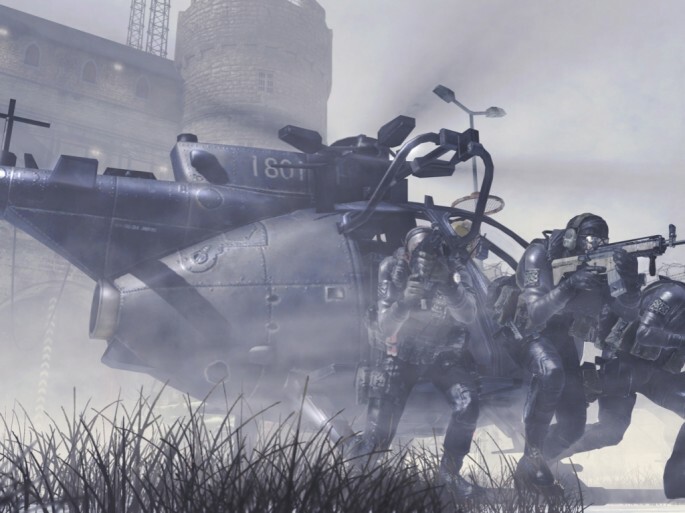 Call of Duty would not be Call of Duty without its online multiplayer. If you played the original Modern Warfare at all online, you will be immediately familiar with Modern Warfare 2. The controls are the same, the overall level and perk systems are the same, etc. What has changed is… everything else. The level cap has increased from 55 in Modern Warfare (and 65 in World at War) to 70. To help get you there, you can unlock an insane number of challenges that earn you new weapons and bonus XP. The perks have been tweaked and made upgradeable to “Pro” versions that further enhance your soldier and add even more strategic and tactical options to your repertoire. 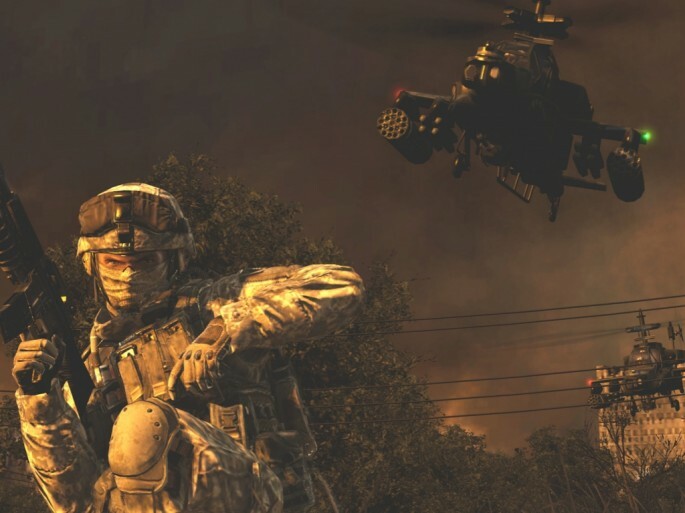 There are several that return from Modern Warfare and several that are new to Modern Warfare 2. New perks include “Scavenger,” which lets you pick up ammo from dead enemies, “Bling” for adding multiple attachments to your weapons, and “Scrambler” for jamming nearby enemies’ radar. The kill streak rewards from Modern Warfare are back with some friends. UAV brought along his brother “Counter-UAV” for disabling enemy radar. It’s much harder to call in an air strike when you don’t have a map for reference. The “Air Strike” brought along the “Predator Missile” that is guidable by the player and rains down death on your enemies. The “Helicopter” wasn’t invited, so it invited everyone else that it knew, from “Sentry Gun” to a player-controlled “AC-130” gunship. If you are either lucky or extremely good, you may even find the “Tactical Nuke” after a kill streak of 25. Hands down, the best new kill streak reward weighs in at a very obtainable 4 kills; the “Care Package.” This is no box of cookies and mix tapes; a care package will hold anything from a UAV to an AC-130 that can be called in. This is a great way for lower level and lower skill players to get a taste of the more advanced kill streak rewards without having to be able to string together 11 kills for an AC-130. To add another twist to it, the care package shows up on the map and can also be picked up by enemies. Be careful where you drop your care packages! In addition to being rewarded for killing, you now get rewarded for dying! As you rank up, you will also unlock new “Death Streaks.” For example, “Copycat” will allow you to steal your killer’s class after dying 4 times without a kill. The noobish “Martyrdom” perk from Modern Warfare is back as a death streak, as is “Final Stand”. For those that just need a little extra help, you can use “Painkiller” to give you a big health boost for a short time after you spawn. Leveling up and completing challenges also earns you a new badge of honor called the Call Sign. The Call Sign is a badge that pops up when you do something cool or stupid during a match. The enemy you kill sees your call sign during the killcam. Everyone sees your call sign when you do something awesome like shoot down a helicopter or capture an objective, etc. The Call Sign includes an unlockable title that describes something awesome or stupid that you’ve done. There are also a bunch of unlockable emblems that you can choose that are graphical representations of your deeds on which your clan tag, PSN ID, rank, and level show up as well. To help you grind up to level 70, Infinity Ward has kindly added a whole slew of new challenges to go along with the new features of multiplayer and to help give you those extra XP boost injections. Each weapon includes a “Mastery” challenge that gives you a ton of XP for unlocking all of the attachments for a particular weapon. But to unlock each attachment, you have to get kills while using the previous attachment, so now there is even more incentive for people to kill me with a rifle mounted grenade launcher. Thankfully, the range of the “noob tube” has been tweaked so you won’t be getting killed by one from across the map anymore. 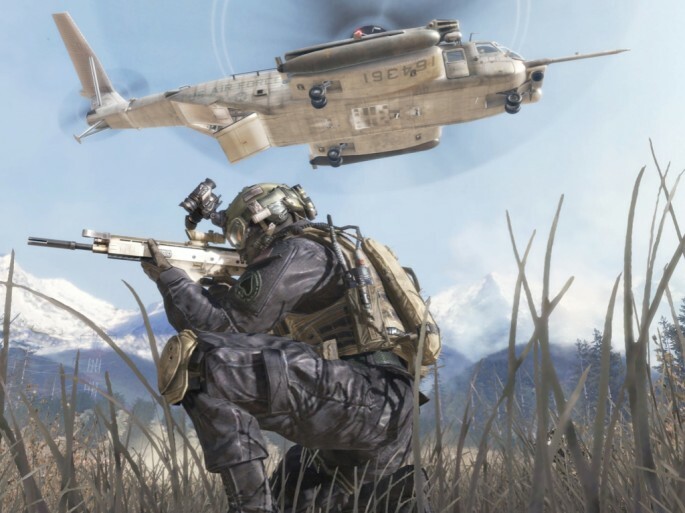 A new Call of Duty also needs to have a bunch of new weapons, and Modern Warfare 2 is happy to oblige. New to this installment are the likes of the FAL and the ACR assault rifles, the UMP45 and Vector sub-machine guns, the L86 LSW and AUG HBAR light machine guns and the Intervention and M21 EBR sniper rifles. Shotguns like the SPAS-12 and AA-12 are now secondary weapons, as are RPGs, AT4-HS rocket launchers and Stinger and Javelin missile launchers, as well as machine pistols like the PP2000 and M93 Raffica. This makes the lives of snipers much easier, and lasts much longer when an enemy gets too close for comfort. If you are a pacifist, or just want to help our your teammates, you can whip out the Riot Shield. The Riot Shield protects most of the front of your body from weapons fire and explosives, allowing you to withstand most assaults and allow you to protect an objective or just keep from getting shot again for the tenth time in a row. Gone are the ever present frag grenades and the multiple frag grenade perk, but as a consolation prize, we get quite a few new “equipment” options. Grenade lovers will still love the Semtex timed sticky bomb, and the throwing knife is a re-usable knife that you can fling at an enemy to silently take them out. No game of this scale is without its issues. Shortly after the official launch, party invites for PS3 players stopped working due to server errors, but this issue was given top priority by Infiity Ward, Activision and Demonware and fixes were available relatively quickly. As of now, multiplayer is working beautifully, despite having more than 300,000 people online at the moment.